Target participants： Actors, Directors, Drama teachers etc. 1. If you are interested, please e-mail or give us a call, we will then e-mail an application form to you. 2. Please complete the application form and e-mail it back to us. The workshop fees must be paid before 15th AUGUST. If payment is not received in time, the organizer has the right to cancel your application. 4) After banking in, please notify us via phone or e-mail details of your name and deposit numbers. 5) Please keep the deposit slip for further confirmation. In the performing system created by Jacques Lecoq, physical movement is one important element. As oppose to the Stanilavsky performing system that emphasize on the fact that performing is from in to out, Jacques Lecoq believes that performing is from out to in. The creation of one character starts from the creation and imitation of physical movement and appearance, and slowly moving from outer physical presentations to establishing the inner feeling and state of mind of the character. How do we then enter the character? Jacques Lecoq thinks that an actor/actress need not imitate realistic character, but through analyzing the movement of nature, animals or materials, one will go into the movement of nature and try to initiate an emotion or metaphorical representations, and eventually creating a theatrical character. Jacques Lecoq does not emphasize on performing realistically, but to create a theatrical character through imitating the movement of nature. Hence in this workshop, we will explore deeper what is the “common poetic essence of human being” （fonds poetique commun）, creating sentimental imagination follow by using physical movement to present unspeakable feelings and movement, through space, light, color, materials sound and others material phenomena.Through these trainings, we will slowly moving into the movement of nature, for instance wind, land, water and fire, animals, materials etc. These elements will be presented by using the method of Mimodynamique, , through movement, sense of directions, rhythm and tempo. Here, we do not require fully realistic imitation, but to use a more poetic way to present the spirit and movement of exi sting nature. We will slowly going into the creation of theatrical character by starting off with the imitation of animals. Through the movement of animals, we will be able to initiate the way of walking and body gesture of the character, hence creating a more solid and more theatrical character. Clown is the last chapter of the 2 years programme of the Jacques Lecoq school training. This also signifies that, clown is actually the combination of all performing skills. Only performer with rich performing experience can be a good clown performer. The clown we mean here is not clown that are seen in circus or night clubs, but theatrical clown that has a character. We are searching for clowns that utilize drama as a performing form. 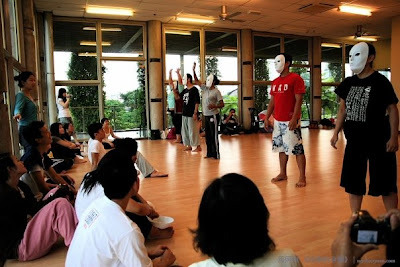 The aim of clown performance is to let people laugh, but how to make people laugh? Like what Jacques Lecoq once said, “ Clown only exist inside the body of the performer who performed . We are all clowns. We thought we are handsome and charming, smart and strong, but actually w e all have weaknesses and things that are stupid and dumb. And when we performed that all out, audiences will laugh“.。Hence, theatrical clown must confront himself/herself honestly, and acceptinghimself/herself. Then he/she can put down all the barriers on stage, and presenting the true self to audiences. Every performer has a clown of his/her own, no one can replace it. The most important thing of clown performance is that no clown wants to play fool on stage, they are all serious. Their feelings and performance are real, only a clown that perform the true self will make people laugh. ２． The practice of music, words and color. ４． Analyzing and practicing animal movement. ５． From animal to human. ７． Introduction to the red nose. ８． Searching for everyone’s clown. The instructor will adjust the rhythm of the course based on the development of the participants. Jacques Lecoq was born in Paris on December 15, 1921. In 1937 he began studying physical education and sport which he taught from 1941 to 1945, gaining teaching diplomas from the French athletics and swimming federations. His interest in physical education brought him into contact with Jean-Marie Conty, a master of physical education and friend of Antonin Artaud and Jean-Louis Barrault. By 1945 Jacques Lecoq had started acting with Gabriel Cousin and the two founded a drama group. He was then taken on by Jean Dasté as part of a theatre company known as the "Comédiens de Grenoble", where he was put in charge of the physical training and body movements of his fellow actors. Here he discovered masks and was introduced to the ideas of Copeau, to the point of later identifying with him as his indirect heir. In 1948 Jacques Lecoq went to Italy where he settled for eight years. He staged his first pantomimes at the university theatre in Padua, while in the city markets he discovered Commedia dell'Arte. He met the sculptor Amleto Sartori and together they embarked on research into masks, ultimately leading to joint projects including, inter alia, the "neutral mask". Invited by Giorgio Strehler and Paolo Grassi, he joined them for the launching of the school at the Piccolo Teatro in Milan. Later ventures included work as a director and choreographer, working together with figures such as Dario Fo, Franco Parenti, Luciano Berio and Anna Magnani, pursuing the quest for new movements suited to contemporary music, reviews, opera, and devising movements for choruses in Greek tragedy in Syracuse. In 1956 he came back to Paris and opened his School of Mime and Theatre. At the same time he set up his own theatre company, worked at the T.N.P. (National Popular Theatre) with Jean Vilar, and also on television, but before long the school had expanded and he devoted all his efforts to teaching. From 1968 to 1988, Jacques Lecoq was a teacher at the French school of fine arts (Ecole Nationale Supérieure des Beaux-Arts) where he developed a teaching programme on architecture based on the human body, movement and the "dynamics of mime". In 1977 he founded the stage design department of the school, known as LEM (Laboratoire d'étude du mouvement — movement research laboratory). Jacques Lecoq was a member of the Union of Theatres of Europe, touring the world as guest teacher and speaker, giving master-classes and lectures, including the performance lecture entitled "Tout Bouge" [Everything Moves]. Permanent video records were made by Patrick Lecoq in 1983. In 1997 and 1998, Jacques Lecoq worked in close partnership with Jean-Gabriel Carasso, Jean-Claude Lallias and Jean-Noël Roy, ultimately producing the book "Le Corps Poétique" and producing two 45-minute documentaries for French television. Only a few days before his death, on January 19, 1999, Jacques Lecoq was still teaching at the school. After having finished her studies in Humanity and Economy at National Taiwan University, Ma Chao-chi has decided to fallow a professional theatre study at the Educational Theatre program at New York University and then went on studying at the International School of Theatre Jacques Lecoq at Paris where she learned Mime, Acrobatics, Masks, Clown, and physical theatre. In 2002, she made a tour in east and central Africa with Company Imibala where she performed in a street theatre. 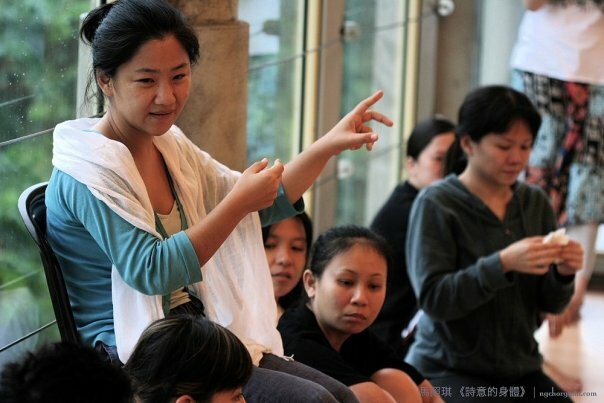 She has also given theatre workshops to children and artists in the counrties where they performed. 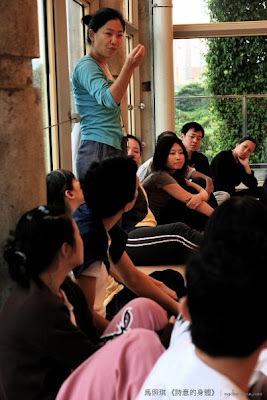 She then returned to her native country, Taiwan (Repiblic of China), in 2003, and created her own company « Theatre de la Sardine » in 2005 where she tries to find a new forme of popular theatre by mixing the street theatre, mime, masks, clown, theatre of objects, dance, and acrobatics. She transtated the book « Le Corps Poétique » by Mr.Jacques Lecoq from French to Chinese, published by Laurel Publishing Company, Taiwan in 2005. She is also professor of the theatre department in National Taiwan University of Arts and of Taipei National University of Art. 1997 Graduated from National Taiwan University in Economy. 1998 Graduated with a « Master of Art » degree from Educational Theatre program in New York University. 2001 Gradualted from the International School of Theatre Jaques Lecoq after completed 2 years of study. 2008 « Mamou and the fairies ». Taipei Children’s Theatre. 2004 « A Clown’s Poetry », The Red Theatre, Taipei.